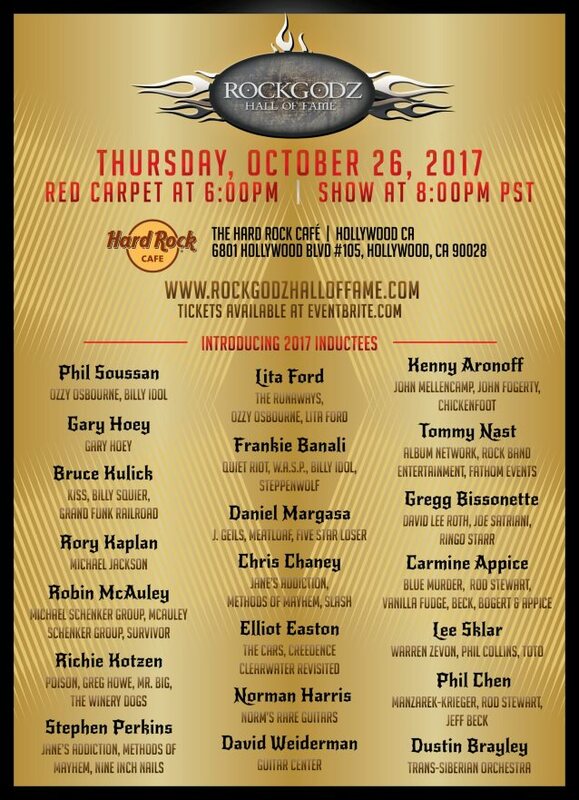 Lita Ford, Phil Soussan (OZZY OSBOURNE, BILLY IDOL), Frankie Banali (QUIET RIOT), Carmine Appice (Rod Stewart, BLUE MURDER, VANILLA FUDGE), Bruce Kulick (KISS, GRAND FUNK RAILROAD), Robin McAuley (MSG) and Richie Kotzen (POISON, MR. BIG, THE WINERY DOGS) are amng the musicians who will be inducted into the RockGodz Hall Of Fame on Thursday, October 26 at the Hard Rock Cafe in Hollywood. California. Starting at 6 p.m. with a preshow red-carpet event, fans will see musicians from some of the greatest bands being honored for their contributions to rock and roll. The music directors are Tony Franklin and Buster Akrey, and Sandy Rizzo is this year’s event manager and artist liaison. The School House Of Rock band will be the house band for this prestigious event, there will be live performances from most of the inductees. For more information, visit www.rockgodzhalloffame.com.